The AAR is a member of the Coalition on the Academic Workforce (CAW), a group of higher education associations, disciplinary associations, and faculty organizations committed to addressing issues associated with faculty working conditions and their effect on college and university students in the United States. Recently the CAW has been focusing on contingent, adjunct, and part-time teachers and researchers. These are colleagues who are off the tenure-track, including faculty members employed either full- or part-time, graduate students remunerated as teaching assistants or employed in other roles, and researchers and post-doctoral fellows. As a part of its advocacy effort, the CAW has developed a survey regarding course assignments, salaries, benefits, and general working conditions of contingent faculty members and instructors. 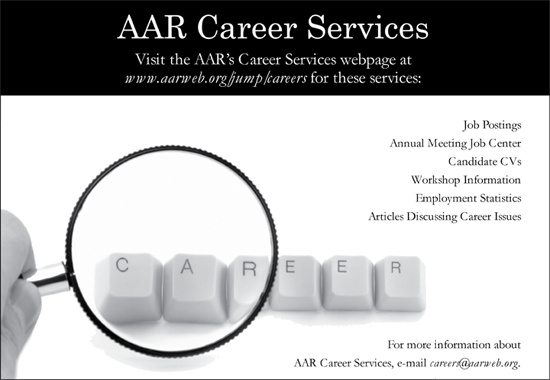 We invite all AAR members employed off the tenure-track to take the survey, which will be available until November 30. CAW’s website, featuring a link to the survey, is located here.